Brianna, also known as the Casual Travelist, likes to take things slow when she travels. 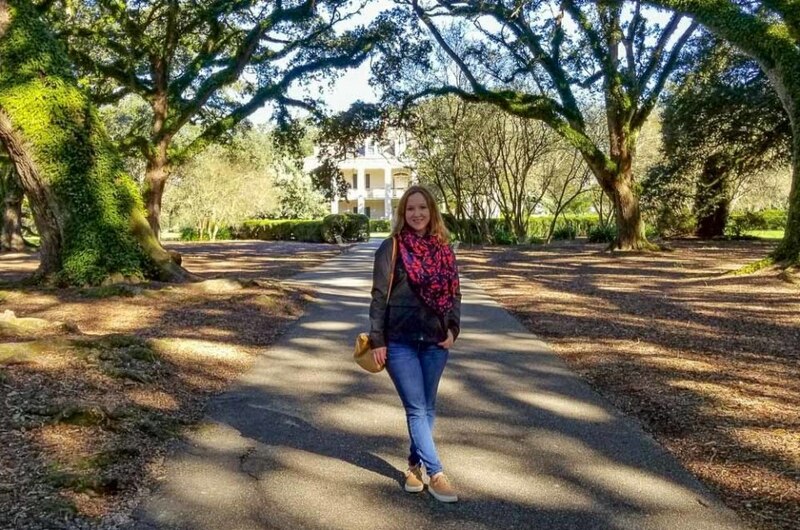 She’s the type of traveler that likes to fully immerse herself in a destination, and that’s why we knew she’d be a great fit to uncover the true heart and soul of Louisiana’s Plantation Country. Traveling just outside Baton Rouge, Brianna discovered the area’s history, charm and even a few delectable bites. Hi Brianna! Thanks so much for joining us today! How did you get into travel photography and writing? I came into travel writing a bit backwards. I was part of the online community for a major travel magazine who needed some content on my hometown of Virginia Beach and reached out to work with me. Having no prior professional journalism experience, I was both thrilled and scared! But, they liked my work enough that I was asked to work on several more projects. I then started my blog, The Casual Travelist, and I’m continually amazed at the people I’ve gotten to meet and the experiences I’ve been fortunate enough to have. Where did you get the idea for your blog name “Casual Travelist”? I have a diverse travel style; I’m equally at home hiking in the cloud forest in Ecuador as I am dining at 3-star Michelin restaurants in Copenhagen. I wanted a name that conveyed my sense of adventure with my laid-back personality, and I think the Casual Travelist fits perfectly. I had been to Louisiana once before to visit New Orleans, easily one of my favorite cities on Earth. In Baton Rouge, I found a city that seamlessly blends Cajun flair and southern charm and whose culture is heavily influenced by the Mississippi River. Louisiana’s food is world renowned, and Baton Rouge is certainly a city that knows how to eat well. Plantation Country is a place that keeps its charms close but is willing to share them with those who take the time to look. Time here is languid, and one of the best things you can do is spend an afternoon under the shade of a live oak sipping sweet tea. Intensely green sugarcane fields spread out from the muddy Mississippi for miles, interrupted only by the occasional plantation house. You also got to spend the night in Oak Alley! What was that like? It truly is a special experience getting to stroll the grounds of Oak Alley after the day-trippers have left. 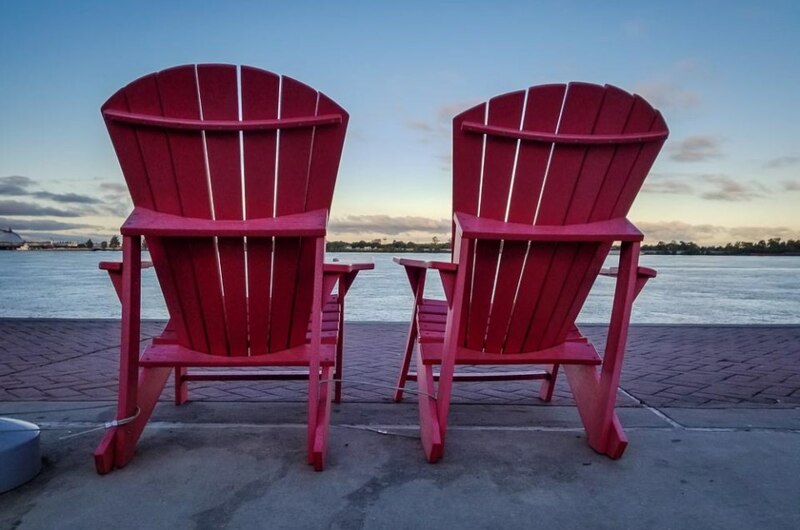 The only sounds you hear are the evening breeze through the live oaks and the gentle roll of the Mississippi River. The onsite cottages are incredibly cozy, and you can’t beat having dinner (including homemade bread pudding) delivered straight to your door. Now that’s southern hospitality at its best. If travelers only had time to visit just one plantation (of the three you visited), which would you recommend? Driving by each plantation looks similar, but it’s the stories of the people who lived there that really make them come alive. If you want classic antebellum architecture be sure to stop at Oak Alley Plantation; however, for something a bit different, the vibrant colors and opulent décor make the San Francisco Plantation a showstopper. Most government buildings are bland, but with as much character as Louisiana has the state capitol buildings are anything but boring. The Old State Capitol proves you don’t have to go to Europe for castle views (seriously, what other government building is a castle?) and the interior unfolds in a kaleidoscope of color capped by a stunning stained-glass dome. Blocks away, the New State Capitol is an art deco masterpiece, and its lobby features beautiful marble murals depicting life in Louisiana. 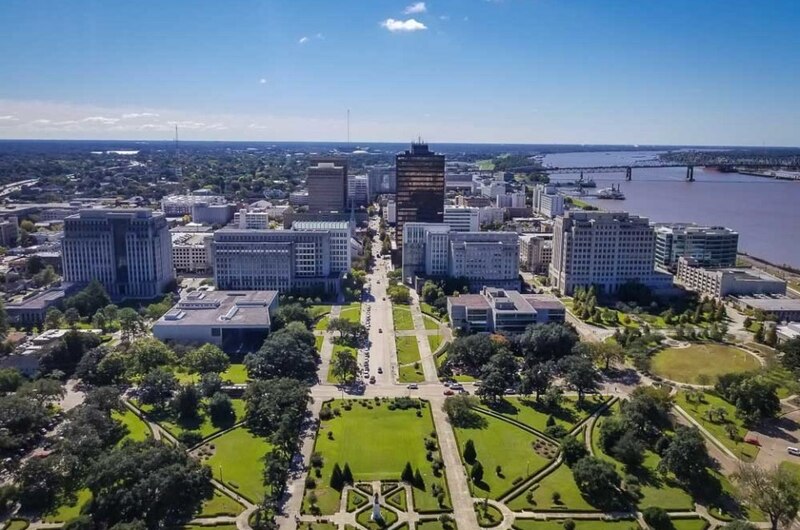 At 455-feet high, the New State Capitol is also the tallest capitol building in the United States; there’s an observation deck on the 27th floor with spectacular views of Baton Rouge and the Mississippi River. My favorite shots were a mix of tradition and surprise. 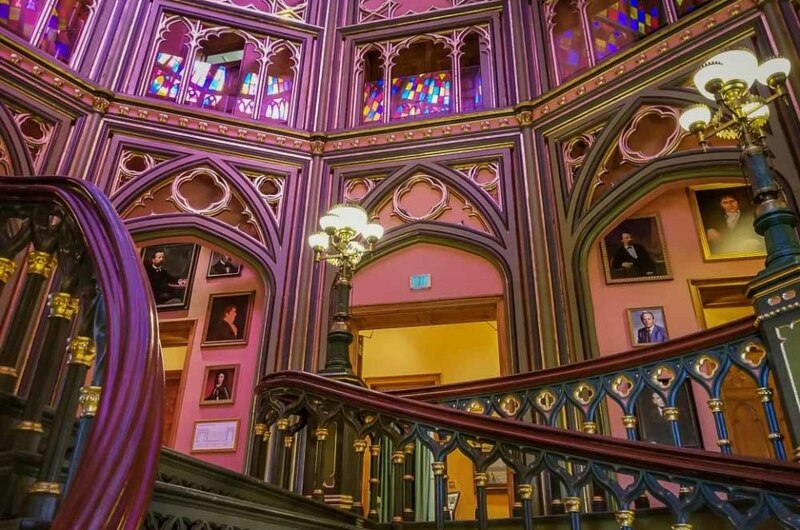 The image of Oak Alley is a classic, and the interior of the Old State Capitol is breathtaking. Getting up early to get sunrise shots over the Mississippi River was completely worth it. Aside from plantation tours, you also embraced the history across Baton Rouge. Can you tell us about some of your favorite attractions? Baton Rouge is a city that likes to honor its traditions and that was evident the moment I stepped inside my hotel The Watermark, a former bank that’s been renovated into a stylish boutique hotel. The Watermark kept architectural touches like polished marble throughout the lobby and it still has a huge bank vault downstairs! The Watermark is within walking distance of two great museums. The Louisiana State Museum tells the story of the 18th state and the influences that made Louisiana home to some of the most distinct cultures in the United States. If art is what you’re after the LSU Museum of Art has a diverse collection ranging from crafts to modern art. New Orleans is a city that is known for its joie de vivre; but the heart of Louisiana lies in its people. Being greeted with a heartfelt “Honey” before sitting down to some of the best fried chicken at Connie’s Grill near Vacherie, talking with the sisters who own St. Joseph Plantation or striking up a conversation with a friendly local at Elsie’s Plate& Pie — these are the moments that will stay with me. It’s not a true Louisiana experience without great Cajun food. What are your top recommendations from around town? I’m still thinking about all of the amazing food I had in Baton Rouge! You can’t go to Louisiana and not get oysters, and the classic chargrilled oysters at Jolie Pearl are among the best in the south. The boudin balls and rabbit and dumplings (a Cajun-meets-Asian dish with pork gyoza in a rich rabbit broth) was easily of my favorite dishes I had this year. Oh, and make sure you save room for dessert! The coconut custard pie at Elsie’s Plate & Pie is pure heaven. How will Louisiana feed your soul? Be like Brianna and take a journey to Louisiana’s Plantation Country. Click here to begin planning.